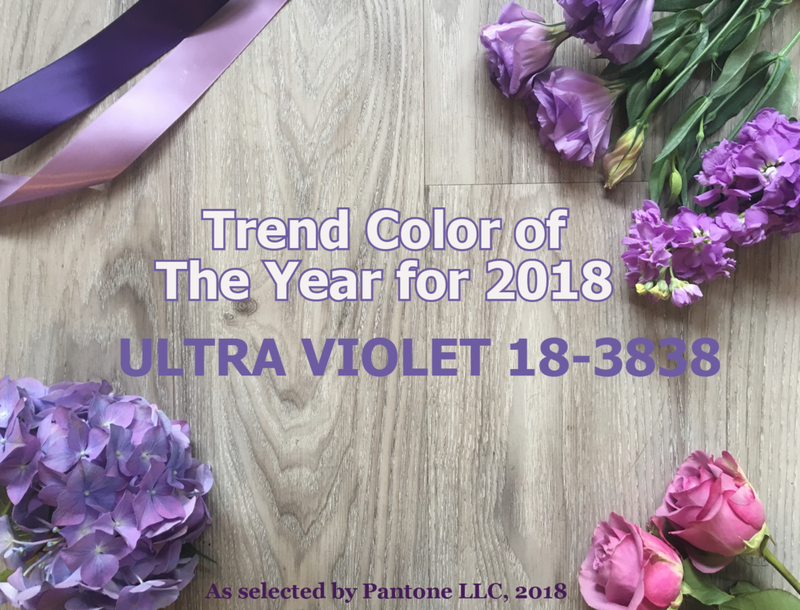 My team and I are not at all surprised to see that the Pantone company has selected a shade of purple for the 2018 color of the year. We could even suggest that we saw it coming, based on a trend that we saw with a few of our brides in 2017. Some of our favorite weddings last year incorporated shades of purples alone or in some really interesting color combinations. Pantone offers some specifics about the color selection on their web-site. “A dramatically provocative and thoughtful purple shade, PANTONE 18-3838 Ultra Violet communicates originality, ingenuity, and visionary thinking that points us toward the future.” Technically, it is described as a “blue-based purple” that reminds me of the medium shade of a Purple Anenome, featured in our Winter Collection. If you read the explanation on the Pantone web-site, you'll learn more about the inspirations for their selection including the musical contributions of Prince, David Bowie and Jimi Hendrix. This, of course, makes the people at Pantone pretty darn cool. Ultra Violet is not an exact match to more than a handful of purple florals (violets, notwithstanding) but there are some really pretty shades in the floral kingdom that come really close. From Roses to Lisianthus, Anenome and Snapdragon, your designer can help you find focal flowers that will add beautiful purples to your palette. 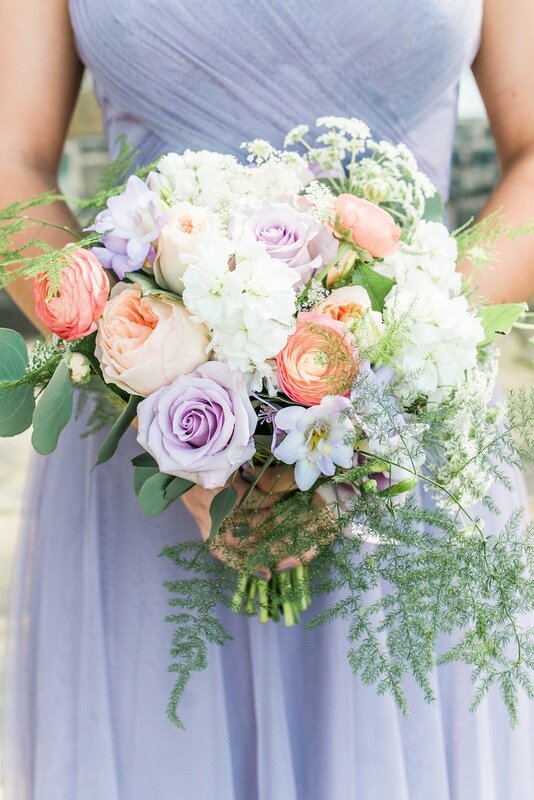 We loved the color combinations that this bride chose for her late Spring wedding. The peach and purple combination make this a really unique and stunning floral display. Read about some of our "purple" themed 2017 weddings using the link below. Alleigh Marre, a 2017, J. Morris Flowers bride, shared her inspiration for her gorgeous wedding at Rust Manor (Leesburg, Virginia) in this short Q & A. 1. Your bridesmaids wore a beautiful shade of purple. What was the inspiration for that selection? Purple has always been one of my favorite colors so it was something that I gravitated toward naturally when choosing the overall color palette. For a June wedding, I wanted colors that were light and airy. When I was choosing the dominant shade (specifically for the bridesmaids dresses) I wanted to choose not only a dress silhouette that was flattering for everyone, but also a color that provided a nice contrast for all of skin tones. I loved this wisteria color on everyone. Zack and I also knew that we wanted the men's suits to be a bright navy because black felt too harsh for an outdoor afternoon summer wedding. The light purple looked really pretty paired with the groomsmen's suits. 2. 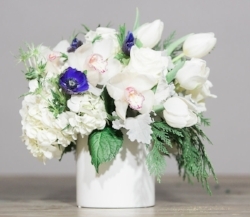 Your flowers also include a lot of white, green with focal flowers in burgundy and purple, a really pretty combination. How did you put those colors together? Once I chose the dominant lavender shade the rest fell into place. Overall, I wanted it paired with soft whites, pinks, and greens, but I also wanted there to be a contrast reflected to add some depth, especially for photos. 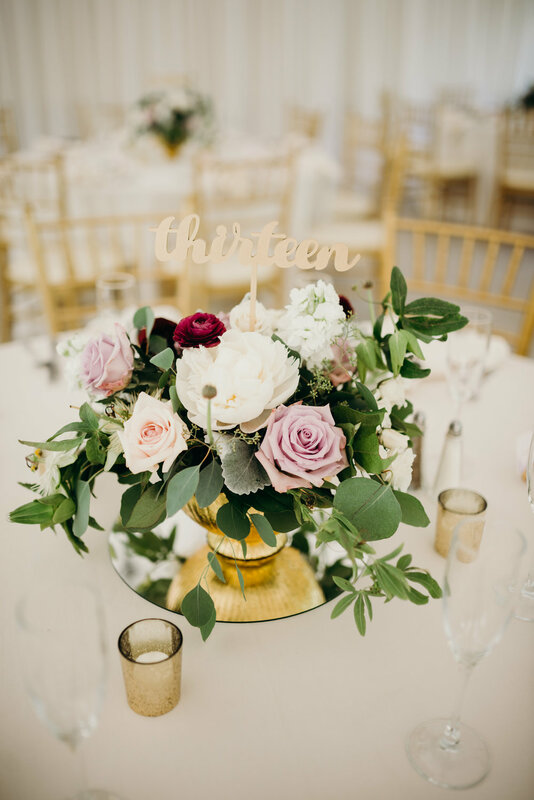 I also wanted a dark color to be included in the flowers that would coordinate with the deep tones we were pulling from the groomsmen's navy suits -- the burgundy shade hit that note. 3. Did you incorporate purple or lavender into any other aspects of your décor? Yes - our invitations, my jewelry, event signage, cake, table settings, the groomsmen's ties and socks all incorporated the same color theme. Each year, we anticipate the announcement of the color of the year. Marsala in 2015, Rose Quartz and Serenity in 2016 and Greenery in 2017, the Pantone Company has selected colors that we can mimic so beautifully in our every day and wedding designs.